check out the fresh snap peas from our garden too. yummmm. 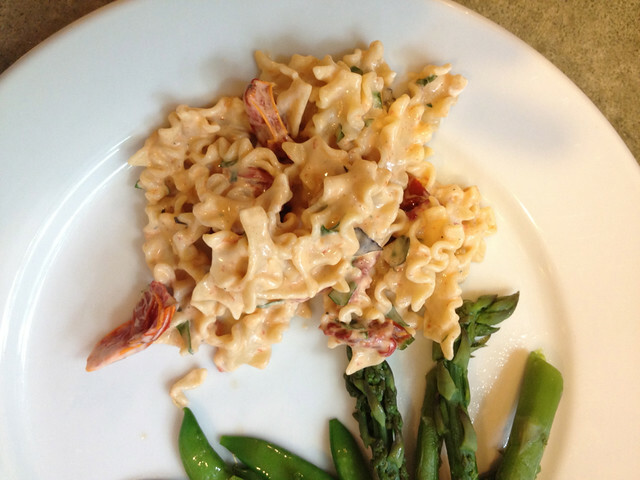 The ingredients in the refrigerator last night led me to this simple and very tasty pasta recipe. Roasted tomatoes are wonderful and the goat cheese made it nice and creamy. Grace announced that this is now her favorite pasta. Below is the recipe that I followed pretty much as is except I cooked the tomatoes at 300 degrees for about an hour and they were perfect. I also used a different kind of pasta and didn’t have too much basil yet so used a bit of parsley, basil and oregano from the garden. Line 2 large baking sheets with parchment paper. 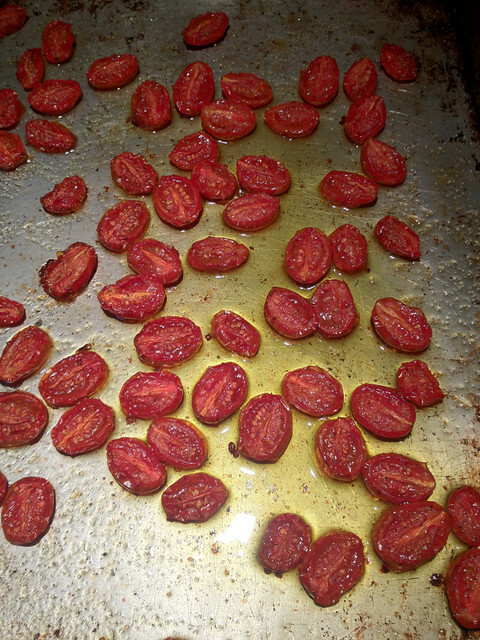 Halve each tomato and place cut side up in 1 flat layer on the baking sheets. Drizzle the tomatoes with 1 tablespoon of the olive oil and sprinkle on the salt. Roast until the tomatoes are dried around the edges but still moist, about 2 hours. Cook the pasta in salted boiling water according to the package directions. Remove 1 cup of the cooking liquid and reserve. Drain the pasta well and return to the pot. Add the tomatoes, goat cheese,basil, reserved cooking liquid, and remaining 2 tablespoons olive oil. Toss well and season with salt and pepper. Serve warm.